Arundhati became suddenly well-known after her beautiful rendering of that excuisite song 'Phagoon ke daaklaam'. A very unusual song with a wonderful melody and quite philosophical lyrics with deep meaning. I consider this song as one of Salil's finest creations. 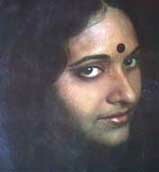 Since then Arundhati sang quite a few memorable songs of Salil, such as 'Ke jaabi aay' and 'Porey thaak pichhe ei gaan'. She has a wonderful voice full of expression and warmth. She can really express a sad song with all her feelings and can also bring out the joy in happy songs. Although Sibaji started his career as a 'Hemanta Kumar' clone, he did find his niche as a good singer with a deep and warm voice. He became popular as a Rabindra Sangeet singer and also recorded songs for quite a few composers in Bengal. Salil used him for at least one film (Mahabharoti) and recorded a few solo songs and some with his wife Arundhoti Holme-Chowdhury. My favourites are his solo 'Jakhon asajjho hoi' and that unforgettable duet ' Aar ki Bolbo Bolbaar kathaa sesh hoye galo' with Arundhati. Recently, in one of those rare Doordarshan programs, both of them sang the hindi version of 'Ore O sujon maajhi'. Beautiful song and Yogesh wrote the lyrics. Since Arundhati is married to Sibaji, I thought it would be nice to put them on one page. Song #AS7 has another Hindi version (OB8). This hindi version was sung by Arundhati-Holme Chowdhury and Sibaji Chatttyopadhyay in a Doordarshan program sometime in the early '90s. The lyrics are by Yogesh. Song# AS14 was previously recorded by Usha Mangeskar (#OS53) with completely different lyrics. Song#AS20 is a much better version than the original recording by Hemanta. Sadly Hemanta's voice in the '80s was not the same as his earlier singing career and he found it difficult to hit notes. There is no doubt that Arundhati sang some superb songs for Salil. Very close to my heart is "phagun ke daaklaam" - but I do not understand why Salil asked Arundhoti to sing the bengali version of "saathi re" from "Poonam ki Raat". That song had remains till today one of Salil's masterly compositions and even Salil once admitted that that song is one of his favourites. We all know how spellbinding Lata's version is. For the same reason I have no idea why Salil wanted to record "chole je jaay din (#AS22)" again. Arundhoti's version is nowhere near the original sung by Shyamal Mitra for the AIR. Ok, so the AIR song was never released but Arundhati's version is, to be very specific, pathetic. I am sure everbody will agree that after listening to the original hindi version "guzar jaay din" in Annadata, sung by none other than Kishore, one feels sorry for Arundhati for having to sing this song. I really blame it on Salil.